Welcome to the US outline layout being constructed by the MMRS. 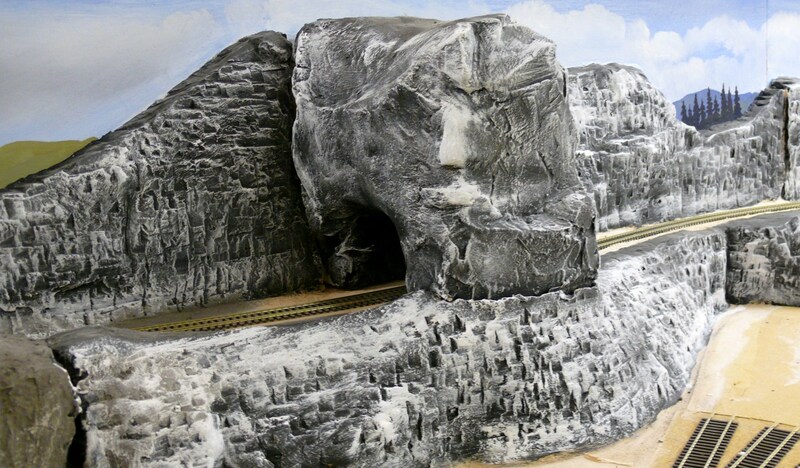 The layout is based in the Appalachian region of the mid/south eastern region of the USA and set in the “transition era” – which, in America, means the early 1950s. Therefore both steam and diesel locomotives can be used. Not only does this give us additional operational interest, it means we can have the fascinating apparatus that goes into a steam loco servicing point! 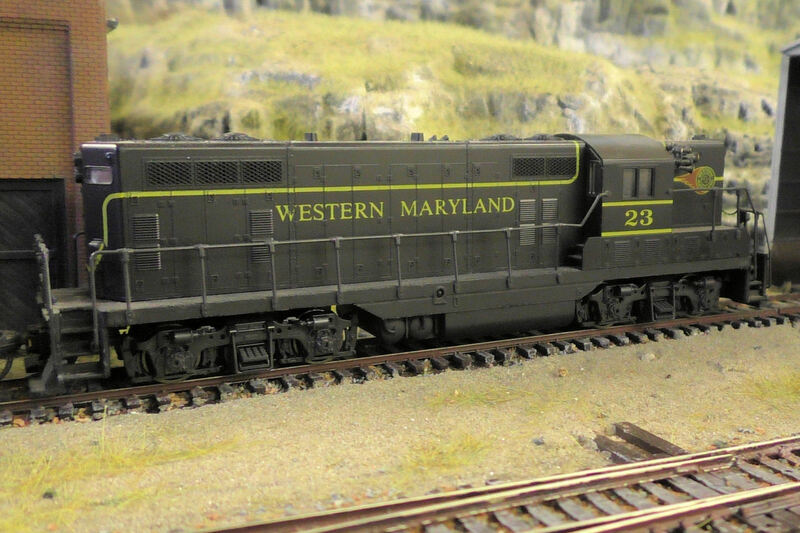 This is coal country with a variety of railroads serving the region, so as two of the main ’stock providing’ members have rolling stock for both the Western Maryland and Chesapeake & Ohio railroads, a location was chosen where these two roads could meet. Greenbrier Junction is just such a place although we have only used the name rather than copying any actual track plans. What we wanted to do instead was to try to capture the feel of the place and also have something we could enjoy operating trains on, which would pretty much always have something moving. This in turn should keep the exhibition public entertained and, hopefully, enlightened. Baseboards have been built and the legs added, using the method perfected by Bob Harper for Canaan Valley. The boards are not only lightweight but very quick to assemble and knock down, most useful at the end of a show. 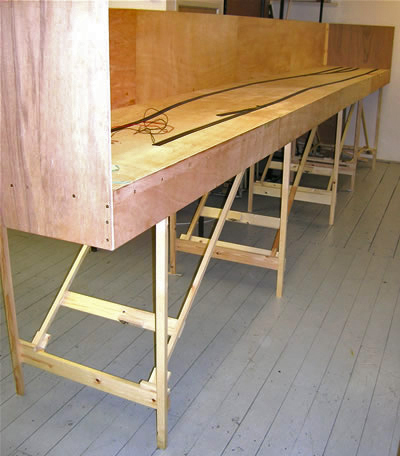 There are four baseboards each 4’6” long by 2’6” deep, giving a layout 18’x2’6” which stands about 3’6” high, although the backscene makes it appear much taller. The principal construction material is 9mm ply, 6” deep strengthened with 3”x½” timber battens under the baseboards. A notable feature is the backscene which is integral with the framing, giving great strength and stiffness to the boards. The 2”x1” legs fold away beneath the baseboard, along with the leg bracing – everything either hinges or uses case catches, no loose nuts and bolts here. The boards themselves use dowels by C&L for alignment purposes and case catches for positive locking together. Some very nice locos were in evidence, all dcc sound fitted. Contol gear will normally be Lenz digital, shared with Canaan Valley, but when both layouts are operating an NCE Powercab system is on loan. principles to follow: the layout has to have a purpose, be entertaining to the public and, also, entertain and challenge the operators. The plan we came up with has a fiddle yard hidden beneath a hill with a single line emerging from a tunnel, almost immediately crossing over a river (perfectly prototypical in this part of the world), passing a small loco servicing yard and then splitting, one line going to what we (in the UK) know as colliery sidings, the other line going on towards a main yard, various sidings and a depot. The colliery sidings would be where empty coal trains arrive and the mainline loco then removes the caboose and “retires” for a while. A switch engine or mine run loco then takes charge and breaks the train into manageable sections, this then goes forward and into a lead (headshunt) at the far end of the colliery sidings. At this point there is a severe grade. Once sufficiently far forward, a switch is cleared to allow the mine run train to rise further up this switchback line, climbing up past the yard and the loco facilities, over the river on a higher level, through a ridge and into the coal mine area (above the fiddle yard). Being set in this part of the USA, this is not actually the coal mine itself however, it is just the tipple where coal has been sent from the mine, cleaned, graded and stored ready for shipment. Our mine run loco then breaks the short train into cuts of one or two cars, ready for loading (with real coal). 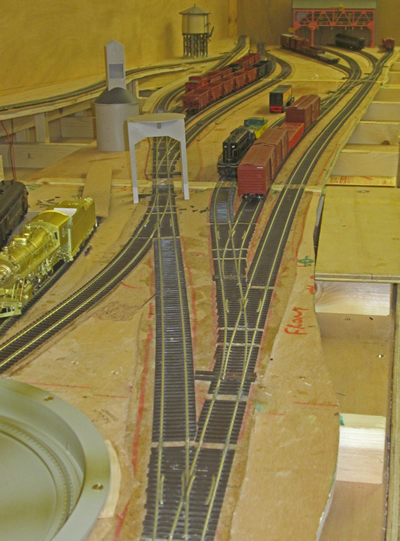 Once this is done, the whole process simply runs in reverse, ending with a loaded train in the fiddle yard. 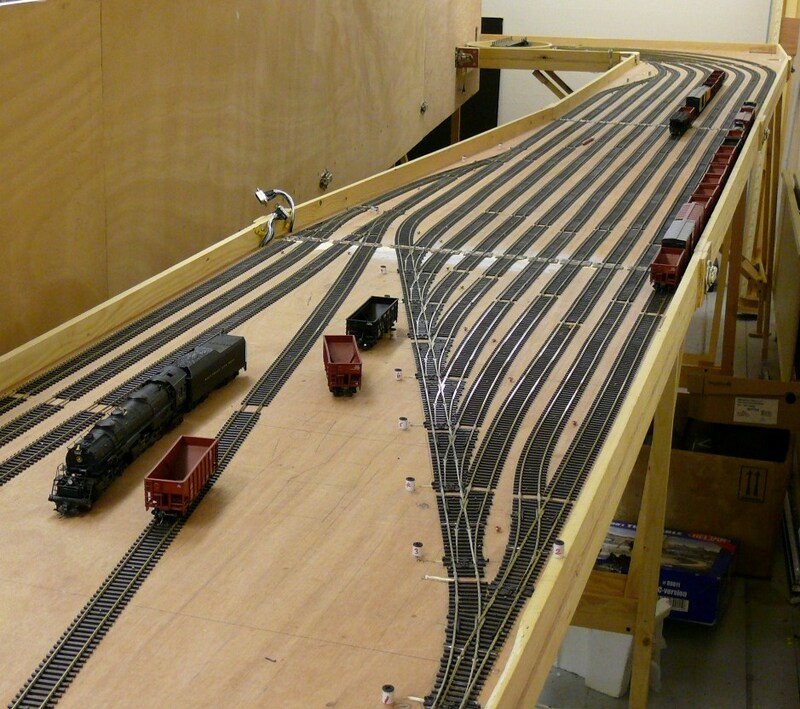 Back to the rest of the layout, the yard can be used for longer coal trains (or trains with too long/heavy locos), local pick-up freights (locals in US parlance) and trains of one company coming in to exchange cars with the other company. At this time, we can still run short passenger trains too, so there should always be plenty of activity on the layout. Once we knew we were going to have a river, we realised that we needed to elevate the track levels (rather than cut into the baseboard) so we added a series of 2”x1” battens on top of the boards in order to have plywood roadbed where there is track. This method will also be useful when building the tipple line, to get the gradient right. 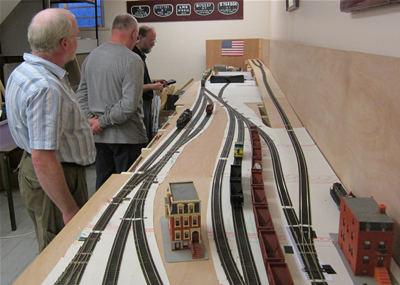 Having decided upon a track plan, we set about placing track on the layout. We have used Peco Code 83 American line track as it is reasonably priced, fairly accurate looking, performs well and is easily available. However, we decided that the switch (point) blades were the weak point and have replaced the original blades and the over centre springing unit to give us a finer looking and more reliable switch. Now we are fine tuning the track plan and setting the locations for the point motors. At the running session on 12th August, the progress since the start of the year is clearly visible. After a lengthy period with the layout dismantled so that we could work on the wiring, we have re-erected all the baseboards and connected everything up. The control panel still has work to be done on it, but all the points, turntable and fiddle yard are now fully operational. 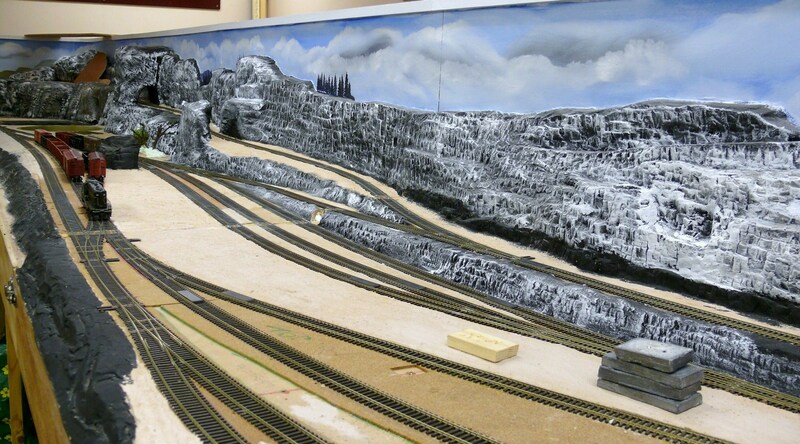 There is obviously a lot of minor fettling still to be done to the track, and most of the stub sidings are only pinned down, as their final alignment depends on the buildings to be fitted round them. However, hopefully it is all easily understood, and has been operated for the first time by a bystander, in both DC and Digital modes, with little difficulty. It can be operated in either DC or Digital modes (the Lenz system is wired in) at the switch of button, or any other system that a member prefers, again just with a simple switch and connecting in the 2 input wires to a screw terminal block. We will try to leave it always set up ready for DC operation, with DC controller plugged in. 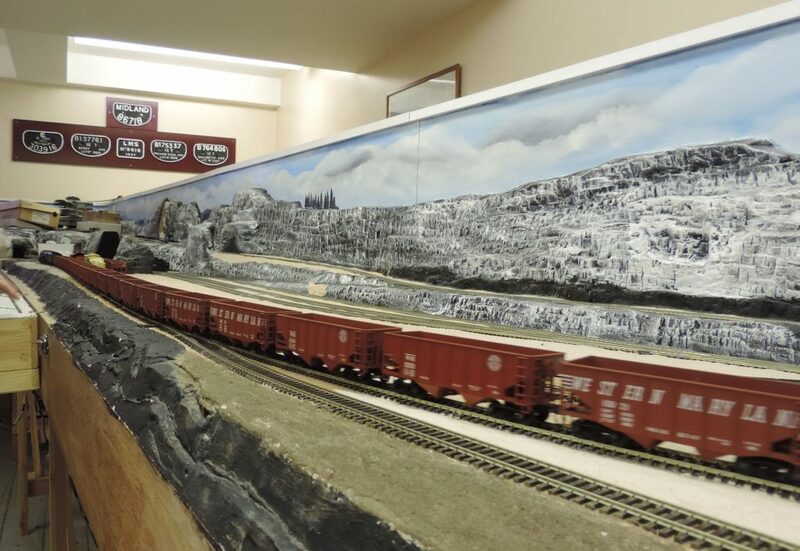 The nominal standards are HO in West Virginia, but obviously the track is fully compatible with modern OO stock, so can be used by many members, and as a demo track for visitors who want to run their latest present! We are quite happy for it to be used when we are not around, but would be grateful if anybody wanting to use it has a brief tutorial from us first. A great deal of progress has been made since our last update. The team divided so as to get on with the scenic work as well as building the baseboards for the new fiddle yards. 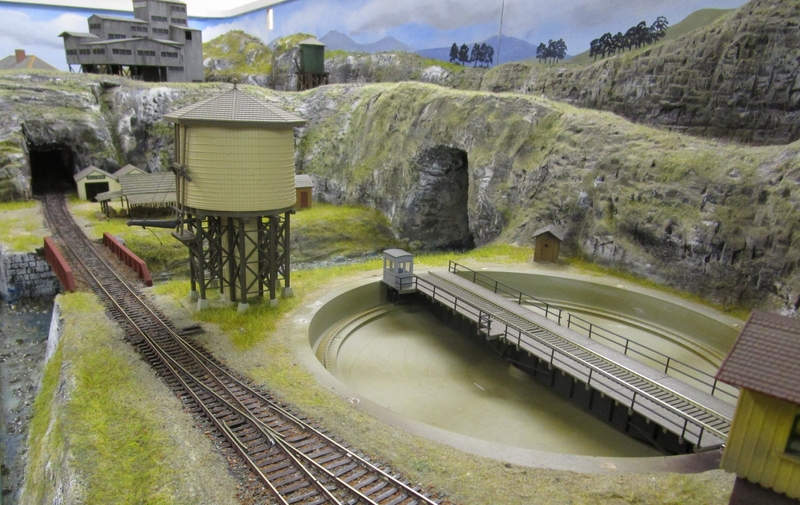 The aim was to have the layout fully operational and reasonably well finished by the end of 2015 so that it could appear at our exhibition in early December. We succeeded (just!) in achieving this target. The exhibition was its first public outing and also the first time the layout had been fully stocked and fully operational. 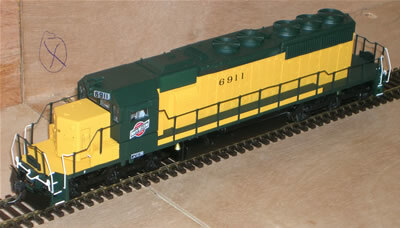 All the stock was new to the layout and was understandably a little ‘track sensitive’ in various places. 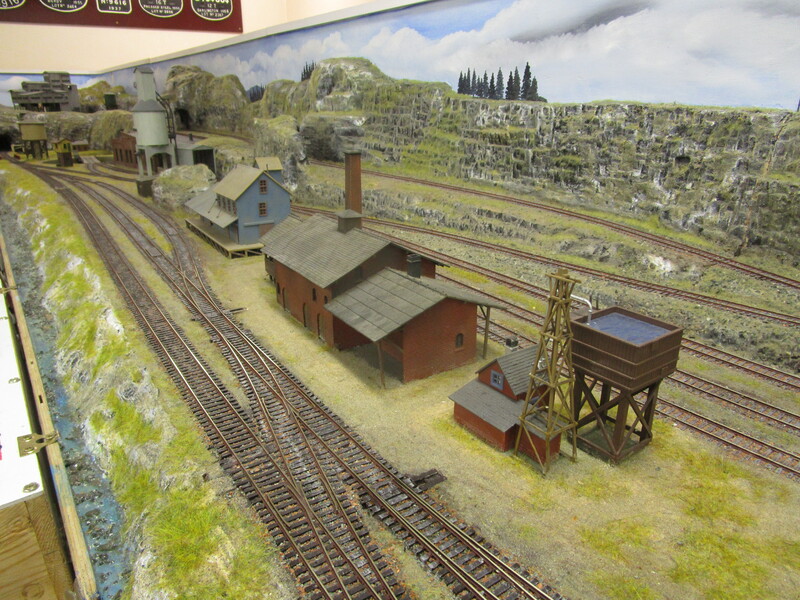 Apart from the odd teething problem which is inevitable with running a new layout for the first time it all worked well and entertained those who were able to visit the show to fully appreciate it. We had a crowd 4-5 deep in front for much of the time and a number of visitors were invited to help operate it, staying there for 2-3 hours in one case. 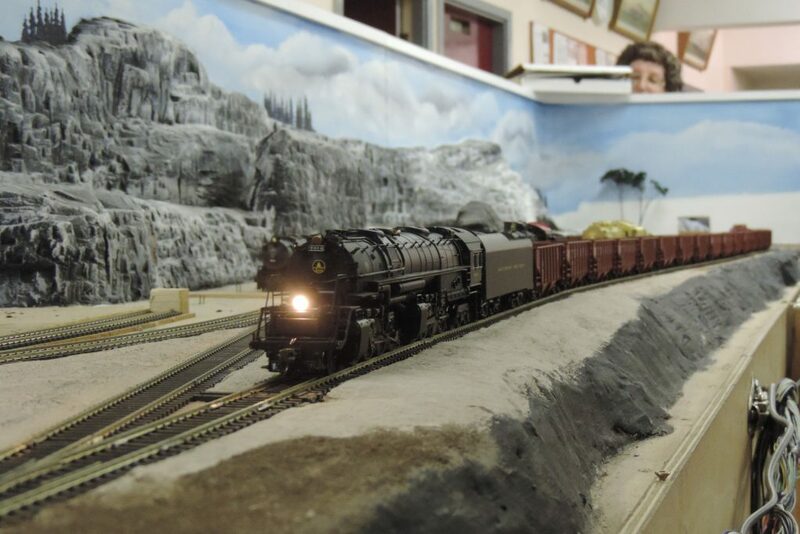 This young enthusiast’s grandfather was so appreciative that he has subsequently donated a large HO American loco to the layout, where it will feel much more at home than on his own P4 British layout. A very kind gesture indeed and one that is greatly appreciated. These new photographs, taken at the club just prior to the exhibition, show the progress made with the layout. If you are interested in joining the team, meeting at Dean Hall on Monday evenings, come along and talk to the Group Leader Bob Harper, I am sure that he will welcome your input. These photos taken a few weeks after the exhibition, featuring a rather long train. 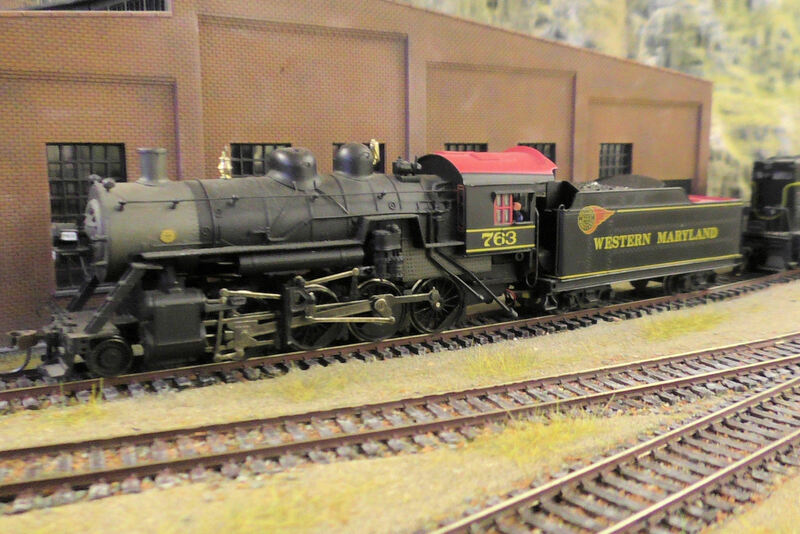 This layout is based on American HO practice, and portrays an Appalachian coal-hauling line, set in the Greenbrier River valley in West Virginia. 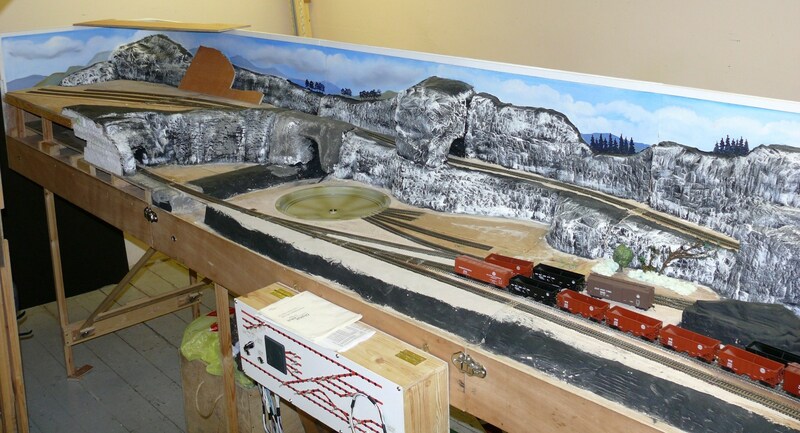 The station represents the meeting point between the Chesapeake & Ohio and the Western Maryland railways, including a small loco yard with turntable and roundhouse, a small interchange yard, and a steeply graded switchback line up to a coal mine. 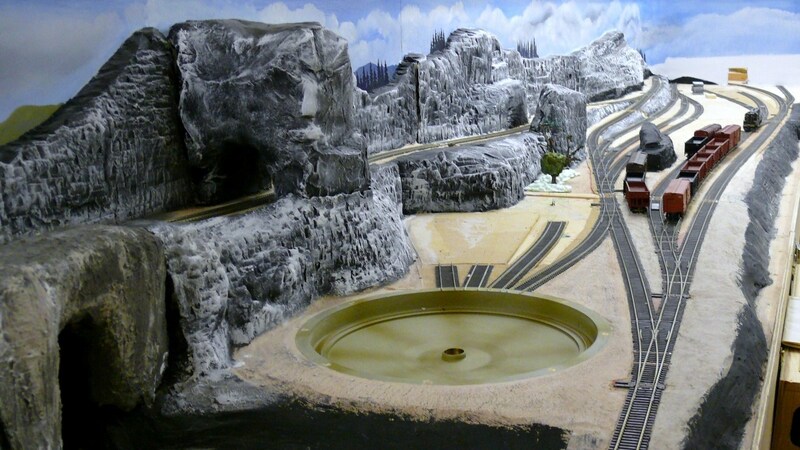 A mine tippler ensures a constant stream of traffic to go out on the main lines, and the location allows stock from all over the East Coast of the USA to visit. As of September 2018, trackwork has been completed (Peco US style code 83, with rebuilt pointwork to improve its appearance and performance) and the control panel and electrics installed and tested satisfactorily. Using a Lenz wi-fi wireless throttle system, the layout was worked intensively at the 2015 Manchester Show; the layout worked well and now we need to get a lot of practice in using it to its full potential. However, experience showed that to give full benefit to Society members, it was desirable for all the tracks in the fiddle yard to be separately isolated, so allowing either DC or DCC trains to be run without restrictions, and this rewiring is now finished. Much practical running has also shown up problems with some of the fiddle yard pointwork; a rebuild with handbuilt track is next on the list. The aim is to get as simple and fault-free operation as possible. As a Society layout, it is available for any member to use; just arrange to have a tuition session with me first, please. All the basic scenery and structures have also now been finished, so, for the future, the construction emphasis will move to the finer details. Anybody who can help in these areas will be very welcome – in particular, in making some of the hundreds of trees we will need to fill the hillsides!